How did you get interested in the Pacific Theater? What got you interested in VMF-214 "The Black Sheep"? Any upcoming projects you want to mention? I grew up in Pennsylvania and attended Aviation Officer Candidate School after graduating from Penn State. Following my commissioning at Pensacola, FL, I went to flight school and was winged as a Naval Flight Officer in 1982. I flew as navigator aboard EA-3B Skywarriors for three years, then returned to Pensacola as an instructor in T-47 Citation II jets. In 1988 I was medically retired due to a spinal cord tumor, so I began volunteering at the National Museum of Naval Aviation (NMNA). Shortly thereafter, I began to write for the museum's magazine, Foundation. I have a lifelong interest in both topics, which became stronger as I began collecting oral histories of navy and marine pilots. I concentrated on veterans of the Pacific war, publishing several of their stories in Foundation magazine. My father was a B-29 pilot stationed at Northwest Field on Guam. He flew missions over Japanese oil refineries using the APQ-7 Eagle radar for night bombing. As a youngster I was fascinated by his collection of photos and documents, including a diary he kept. During my own military service, I was stationed at NAS Agana and was able to drive around the abandoned airfield where he had been based. I doubt many individuals get to experience such a connection. Furthermore, my birthday-December 7-always had significance to me. What got you interested in the Black Sheep VMB-214? While collecting oral histories for the NMNA, I interviewed John F. Bolt, one of the original Black Sheep. Later he arranged for me to join the squadron's 50th anniversary reunion, held at New Orleans in 1993. I interviewed twenty of the veterans, then began gathering documents and photographs to accompany their recollections. From this assortment of material came THE BLACK SHEEP, published by Presidio Press in 1998. My intention was to tell of the service performed by the three incarnations of VMF-214 not just the exploits of Pappy Boyington. Those have been batted around for many years, and I was amazed at how many myths and pieces of misinformation had become accepted as factual. Two years later, I followed up with a full-life biography of Boyington, which had never been done before. BLACK SHEEP ONE was published in December 2000. I attended two VMF-214 reunions. The first lasted an entire week, in May, 1993. It was attended by some twenty original members, including the flight surgeon and intelligence officer. I attended another reunion in November, 2000, also in New Orleans, joined by 13 pilots. Quite a few had died since '93. I remember vividly when the made-for-TV movie "Black Sheep" premiered in September 1976, as I lived in a Penn State dormitory at the time. Now we're on the eve of the 25th anniversary. The show was (and remains-on The History Channel) fun, especially the scenes involving F4U Corsairs. From a factual standpoint, Robert Conrad's attitude and personality were a good match for Boyington's, but the plots themselves were farfetched. Boyington's participation in the "misfits and outcasts" theme for the sake of money rankled most of the Black Sheep, but they eventually forgave him. As for "Pearl Harbor," I'll have to hold my opinions until I see the movie. Folks should remember the number one reason why such films are made: entertainment. Those who are nitpicky about small details will never be satisfied. Speak a little bit about researching and writing your books. I enjoy interviewing veterans, who all have numerous fascinating stories to tell-some funny, some grim. At the same time, I'm something of a skeptic. I treat every anecdote as a "sea story" until I find other documentation to back it up. If stories are confirmed, they gain much more impact. I stay away from tales that seem embellished or flamboyant. Finally, I try to weave these examples and anecdotes into the larger fabric of the manuscript, giving authenticity to whatever point I'm making. As for other sources, much can be gleaned from photographs, and most pilots kept log books that can be measured against squadron documents-war diaries, for example. Quite a bit of documentation was available regarding VMF-214. In the case of Gregory Boyington, I acquired his complete service record and medical history, plus his aviation training records, courtesy of his son. With those records, huge gaps would have existed in his story. My own naval flying background certainly helped. Also, I grew up reading A Bridge Too Far and The Longest Day, both by Cornelius Ryan, and I loved how he presented the story of the "little guy" along with the larger picture. I tried to emulate him by writing about individual pilots and their experiences. I think this is what makes historical books entertaining. Writing about tactics and strategy alone can be pretty dull. I consider Henry Sakaida a real friend. He was very enthusiastic about helping. He provided pages of his research records without ever asking what was in it for him-he truly wanted to see the Black Sheep's history told as accurately as possible. Without Henry's help, the book would have been one-dimensional. I am indebted to him. I'm also glad to say that he helped just as willingly on my second book, Black Sheep One: The Life of Gregory "Pappy" Boyington, and he's assisting me on my next book, which will be about Rabaul. Because of my disability, I cannot travel to such far-off places without serious health risks. However, I did rely on my experiences in the Pacific while I was a navy flier. The conditions in the tropics are similar throughout the Pacific. I am gathering the documentation and interviews for books on Rabaul. 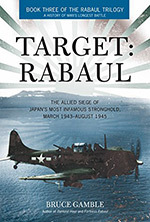 The first will cover the fall of Rabaul when the Japanese overran the Australians in January 1942, and the fate of the small force garrisoned there. I was retired unexpectedly at the age of 30, but my new career as a researcher and writer of World War II history has been extremely rewarding. It has been my privilege to meet more than 20 of the original Black Sheep, and I'm grateful for their support and continued friendship. Readers might want to watch The History Channel on November 29 at 8 p.m. Eastern, when a new documentary called "The True Story of the Black Sheep" will premiere. Thank you for the interview, Mr. Gamble.